Wretched Norfolk poet, John Faust, has had his benefits stopped, the bailiffs are due to evict him, his dog’s in the vets dying, he needs a new clutch for the car, and he can’t finish his poetic masterpiece while the voices inside his head torment him. In despair he throws himself off Beeston Bump, Norfolk’s highest peak, but Lucifer won’t let Faust drown – she loves his book and wants him to finish it. In fact she demands a bigger part and a happy ending. You couldn’t make it up! Rehearsal 4 Declared A Masterpiece by Oscar Wilde! 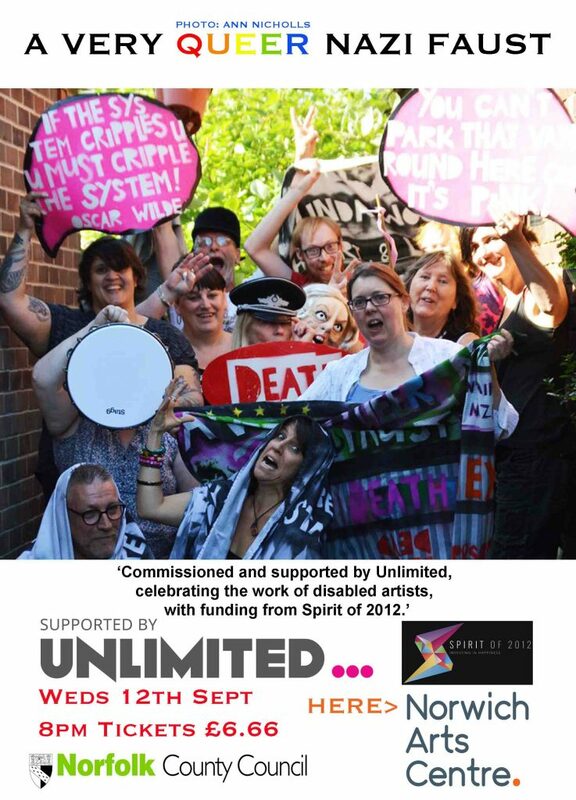 A Very Queer Nazi Faust by poet, artist and disability rights campaigner, Vince Laws, highlights the plight of disabled people under the current government, described as ‘economic murder’ in the British Medical Journal, and as ‘a human catastrophe’ by the United Nations. The performance contains adult themes and language, suicidal thoughts, DWP Deaths, Lucifer, The Naked Abseilers and poetry, but no Nazis. Weds 12 Sept, Norwich Arts Centre, tickets £6.66 from this link. Any plans to tour? Need a venue?